Another for-profit college has closed, leaving tens of thousands of students in the lurch. It's an abrupt move that will impact 35,000 students who are currently taking classes on campuses and online throughout the United States. Many of them are now left without a degree and saddled with student debt. ITT said it also eliminated the jobs of the "overwhelming majority" of more than 8,000 employees on Tuesday. On August 25, the Department of Education barred the school from allowing any new students to use federal loans to pay for ITT -- and the school promptly stopped new enrollment. This action did not affect Daniel Webster College, a school in New Hampshire owned by ITT. That campus remains open to its 700 students, but it will be "difficult" for the school to keep operating without the parent company's support, the president said in an email to students Tuesday. For-profit schools tend to enroll students who rely heavily on federal student aid in the form of grants, loans and military benefits. Without that aid, many students wouldn't be able to go. Before the DOE's ban on federal aid at ITT last month, enrollment had already been slipping. In July, the company reported its new student enrollment dropped almost 22% from the same period the year before. It's not the first for-profit college to run into trouble. The well-known University of Phoenix lost 50,000 students last year, and DeVry University has been sued by the Federal Trade Commission for misleading students about their chances of getting a job and increasing their income after graduation. Last year, Corinthian Colleges closed most of its schools after being slapped with a $30 million fine by the DOE for overstating job placement rates for graduates. The company eventually filed for bankruptcy. 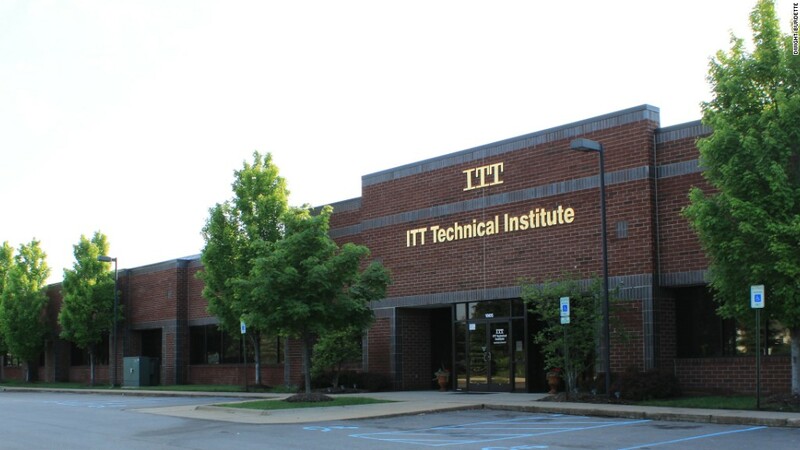 ITT had not filed for bankruptcy as of Tuesday afternoon. Corinthian's closure impacted 16,000 students. It was one of the biggest school closures at the time and the DOE has since made efforts to streamline the process for those seeking debt relief. The 40,000 current ITT students aren't left with many options and many could be stuck with student loans to pay off and no degree. The good news is that their federal loans could be wiped away. Loan cancellation: Current students, or those who had withdrawn in the past 120 days, can apply to have their federal loans canceled, the government said Tuesday. To do so, first contact your loan servicer to find out how to apply for the cancellation. You'll likely need to submit a copy of your academic transcript. Parents who borrowed a Parent PLUS loan from the government to help their child pay for ITT are not eligible for loan cancellation. It also does not apply to private loans. If you borrowed money from a private bank, you should contact that lender to ask if they might offer some debt relief. For more information about how to receive a loan discharge from the federal government, check its ITT announcements page. Transfer credits to a new school: This might not be easy, but those who are close to finishing their program may want to explore this option. On its website, ITT itself says that "credits earned are unlikely to transfer." The DOE said it was working with colleges near ITT campuses that have similar programs to help facilitate transfers. If you are able to continue your program of study elsewhere and transfer your credits, you may not be able to have your federal loans discharged. Currently enrolled ITT students will be contacted via email by the DOE with more information about their options. Alumni: Those who graduated or withdrew from an ITT school more than 120 days ago are not eligible for federal debt relief because the school closed. They could, however, apply for what's called a "borrower defense to repayment" cancellation. In that case, the former student must prove that they were defrauded by the school. You will be asked to provide details about how the school may have violated a state law -- and unlike the case with Corinthian, that's not something the DOE has proved. Were you enrolled at an ITT school that just closed? Share your story with CNNMoney by emailing Katie.Lobosco@turner.com.